Hanoi (VNA) – President Tran Dai Quang has praised the role and effective contributions made by Slovakian Ambassador to Vietnam Igor Pacolak during his tenure in Vietnam, describing it as one of the important factors to enhance Vietnam-Slovakia friendly and cooperative ties. During a reception in Hanoi on August 29 for the outgoing ambassador, President Quang suggested the two sides further uphold the role of the Vietnam-Slovakia Joint Committee for Economic Cooperation, increase the exchange of visits by ministries, agencies and businesses, and promote trade and investment to further lift two-way trade in the coming years. President Quang urged Slovakia to continue supporting and fostering the comprehensive cooperative partnership between Vietnam and the European Union (EU), prompt the early signing of the EU-Vietnam Free Trade Agreement (EVFTA), and recognise Vietnam as a market economy. Vietnam is ready to assist Slovakia in boosting ties with ASEAN and its member states, he said, adding that the country promises all possible optimal support to Slovakian firms to seek business opportunities in the country. President Quang recommended Slovakian enterprises to invest in the fields where Vietnam has huge demand such as renewable energy, infrastructure, environmental protection, food processing, and food safety and hygiene. The President wished that the Slovakian government would continue creating favourable conditions for Vietnamese nationals to integrate into the host country, thus helping to increase mutual understanding between the two nations. 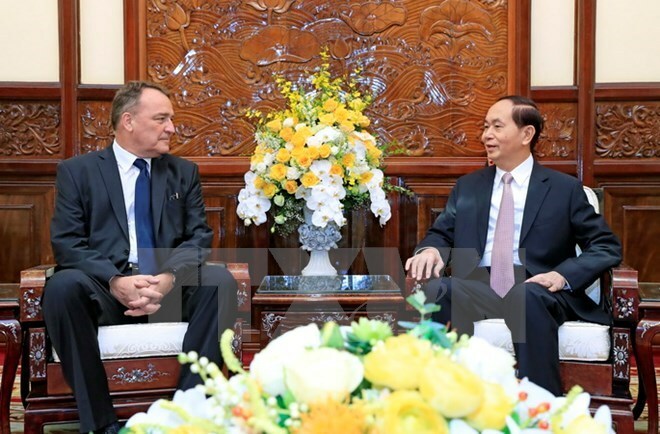 The State leader also expressed his hope that, with his experience and understanding about Vietnam, the ambassador would continue serving as a bridge to propel Vietnam-Slovakia ties forward. Pacolak, for his part, said during his tenure in Vietnam, the two countries has seen more than 30 visits from the deputy ministerial level upwards and signed about 20 cooperation agreements. Vietnam currently ranks 14th in the list of Slovakia’s trade partners.